(870) 862-8131Cost: In addition to college tuition and fees, students must also purchase scrubs, leather white shoes, a white lab jacket, a drug screen, and a background check ($53). 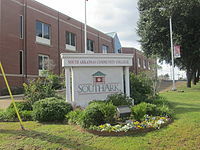 South Arkansas Community College’s Phlebotomy/EKG Program consists of 15 credit hours of classroom instruction as well as a practicum. Students who successfully complete an additional 100 venipuncture specimens will be eligible to take the American Society of Phlebotomy Technicians (ASPT) national phlebotomy certification exam. Coursework includes: phlebotomy, phlebotomy practicum, medical ethics, medical terminology, CPR and first aid, basic computers, and basic EKG.